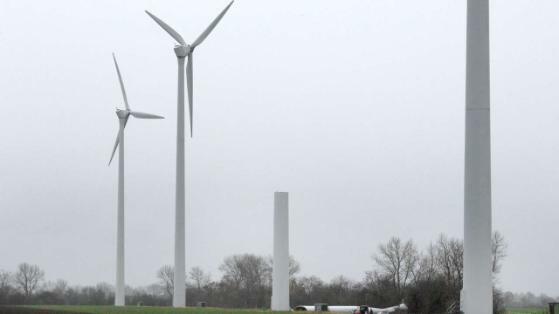 De Bilt reports on yet another serious turbine failure. This time the 100m structure folded at a weld line some 30m off the ground. This is of great concern. Whereas most catastrophic failures are due to installation errors at the base bolts, this is a problem with the specification or execution of the construction of the monocoque structure – the main tower. There’s a fundamental problem here. When steel is welded, the structure of the material either side of the joint, and the weld itself is different to the rolled steel sheet. This inevitably creates a location where stress gets concentrated more as the structure ages. This is because the material at the joint is more prone to ‘work hardening’, a process which occurs, for example, when stresses are repeatedly applied and relaxed by the resonant motion of the structure in the wind. Wind turbines are particularly prone to this because of the heavy weight on the top of the structure and the wind-exposed location they are placed in. Work hardened steel becomes brittle, and brittle materials crack. Cracks are huge stress raisers and can propagate faster than the speed of sound during catastrophic failure. This is the cause sharp, loud whip-crack like noise you sometimes hear when something breaks – a miniature sonic boom. You can see from the photo above that the crack has propagated right around the main tower and caused the catastrophic failure. You can see the aftermath in the photo below. Good job no-one was driving a tractor or walking a dog under this when it came down. 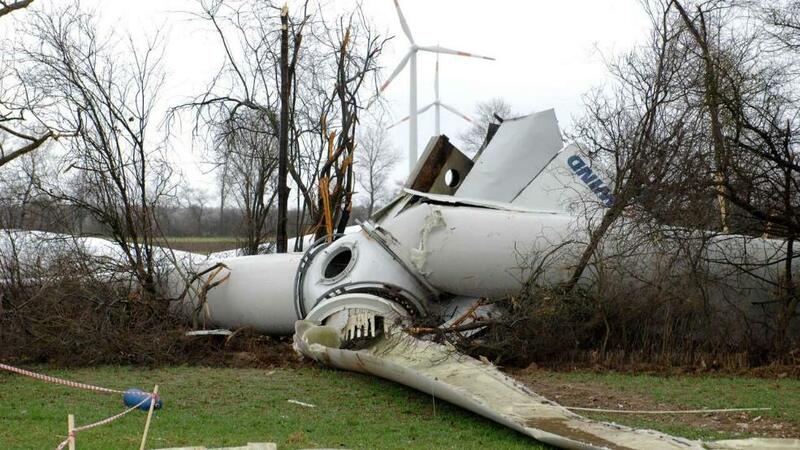 We can expect catastrophic failures such as this one to occur more frequently as the wind turbine fleet ages. So what programme of inspections is in place to regularly inspect wind turbine towers for cracks resulting from work hardening of the weld joints? I don’t know, because the industry is secretive about problems, but when did you last see inspectors with magnifying glasses spraying crack revealing dye penetrant on weld joints 20-100m off the ground up the side of a wind turbine? Time for the government’s ‘Elf and Safety’ executive to step up and give a report on the state of wind industry oversight. Back in the days when I looked at the development of renewable energy like wind, the key determinant of success was reliability. This contrasted with the “academic” approach which was to ignore reliability as something to be sorted out once the important issue of performance had been addressed (by academics). 1. when the break down they don’t produce, so the percentage failure is in effect the inverse in percentage efficiency, because in reality faulty bird mincers aren’t repaired immediately. 3. Finally, the rate of failure effectively limits the useful lifetime (when failures become too high the lifetime is effectively up). You will see that the biggest factor affecting profit is reliability and the smallest is the tiny bit academics focus on: performance. And how do you ensure low failure rates? The answer is simple: the failure rate is largely determined by the engineering experience of a company with that particular product. And if you get a lot of new companies coming into a market like this with a lot of gullible (£ signs in their eyes) customers who know zit about reliability and its affect on actual profits – you get scenes like this. You can use ultrasonic signatures to monitor weld reliability in place at fairly low cost. If you think of it in advance. I worked on this method for some aerospace black boxes for bolt tightness in power transmission. It was thought to be not cost effective despite the low cost because of the frequency of inspection and redundancy. 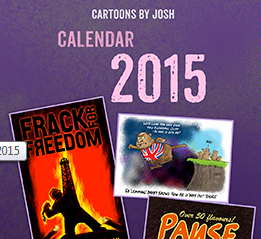 But sending a human up a tower to do it monthly or even yearly has got to affect that calculation. And of course there is no redundancy in towers. I don’t know, because the industry is secretive about problems, but when did you last see inspectors with magnifying glasses spraying crack revealing dye penetrant on weld joints 20-100m off the ground up the side of a wind turbine? No need to do it that way. A ring of ultrasonic transmitters/receivers at each weld could do it. Spacing could be about every 50 cm. And no need to look explicitly for cracks. A change in signature would do it. (Frequency vs amplitude). Oh look a “Good” Wind Turbine. As in the only good one is a dead one. M Simon says:	“You can use ultrasonic signatures to monitor weld reliability in place at fairly low cost. … worked on this method for some aerospace”. There is a huge cultural difference between a successful bird-mincer company and aerospace. Indeed research suggests that there’s an inverse relationship between “aerospace-type” development and success. The type of culture needed for success is that found in a farm machinery company. Here, the machinery is thrashed to death and there is a make do and mend attitude which significantly reduces cost without compromising the focus on reliability (within cost). The difference is this: in aerospace no failure is acceptable. But for a bird-mincer its a balance between the cost of repair versus the profit that will be obtained from carrying out that repair. So for a 3MW machine 25% efficient subsidy 2p(? ), that’s £15/hour which means it has to just keep running with minimal maintenance, hope nothing goes wrong and deal with any problems as they arise. I thought that you tightened the screws, Fritz! I thought that you did, Hermann! WInd turbine tower snaps at join half-way up the 60m tower. Operator has no idea how that could happen. Seems like there’s a shortage of competent Engineers employed in that industry in Germany. Enlarging at the photo seems to indicate corrosion at the flange near the internal ladder. Tramping mud around and letting it sit, will corrode even galvanized fasteners. There are signs of corrosion in other areas. The wind farm was constructed in 1999. Something not appreciated by the wider community and some Engineers is that the towers are part of a machine. They flex in response to the wind and the torque from generating equipment at the top. They oscillate as each blade passes the tower. Naive Engineers will tend to design such structures as a quasi-static ones; with notional, steady maximum loads as specified by the generator manufacturer and “steady” wind loads according to design codes. That’s been known to be inadequate for more than 30 years but is still widely accepted as OK because the product is sacred. Besides; the safety factors intended to allow for variations in materials and manufacture in e.g. structural steel design codes tend to mask much ignorance. In actuality, the tower is a moving part of a machine. Its rigidity deceives; the rigidity necessary for the proper function of the rotating structure; but the resulting thin shell vulnerable to corrosion, impacts and manufactured structural problems. While the tower is not usually observed to flex, it still has to support enormous, dynamic (varying/fluctuating) loads. Fatigue failure is typical and corrosion is a friend of fatigue failure. Nature pays no heed to what some people hold sacred. It doesn’t suspend the natural forces that don’t fit mis-conceptions or design criteria. Looking at the corroded areas, it looks like the bolt holes still contain bolts. If corrosion has taken place between the flanges, could this have caused the bolts to snap under tension? Was there no sealant such as silicon seal – or even paint – placed between the flanges, this not only seals the joint but fills voids and can reduce fretting. Zoom in a bit and you’ll see the main rust areas. If the maintenance techs carried mud in on boots and the stuff settled on the flanges as the tech’s climbed the internal ladders, the corrosion would wipe out any residual factors of safety resulting from design largely out of ignorance that the tower is supporting rotating machinery with oscillating loads. Steel structures has a nominal design life of 25 or 50 years. This one lasted 15 years. Looks like it failed fom a preventable cause. There are several schools of thought on how to maintain the integrity of such bolted joints over the space of decades. The one that is probably most reliable as it doesn’t try to resist the “forces of nature”, is not to try to seal but to allow ventilation through the joint, making the upper section’s inner diameter slightly larger than the outside diameter at the top of the lower and recessing the flange some distance into the upper section. The flanges aren’t then bolted together but a bolt passes through both flanges with a “nut” on each side of the flange, with the length of the bolt between nuts carrying the load. The gap between flanges allows for ventilation (as well as alignment during erection), aided by the gap and “overlap” of the outer diameter of the lower section and the inner diameter of the upper section; forming a skirt. The bolted joint can then be easily cleaned and inspected. Bernd: This photo shows the flanges are internal to the skin of the structure. As you said, if they had made the upper flange bigger diameter by 2 x the skin thickness, they could have allowed the upper tube to extend past the flange and form a skirt to shield the joint. If I understand your description, the studs would have a bigger diameter between the flanges than the holes the threaded sections pass through in the flanges, with nuts either side. This would require a heavier flange section and bigger stud diameters if they were going to take all the load on the stud shoulders. So there is an element of economising in the design. It would be interesting to know what failed. Did the nuts strip off the threads, or did the bolts/studs shear at the thread shoulders? I bet the industry won’t tell us, because then their competitors would know. Even with flange bolted to flange, it’s the bolts taking all of the load in tension. So the bolt sizes don’t change. Not unless the distance between the nuts between the flanges is large and the bolts become “slender”, thus liable to buckling. A load-bearing surface of flange to flange drastically complicates the situation. Both for structural analysis and in practice; especially assembly, where the tower sections then have to be aligned by shims between the flanges. Shims are hit-and-miss, especially when they are placed betwen flexible flanges attached to thin shells. As for the higher costs in materials, it’s offset somewhat in the relaxation of dimensional accuracy of the welded flanges. Their flattness, alignment and position no longer determines the alignment of tower sections if there’s turn-of-nut adjustable clearance betwen the flanges. Until people are killed, it’s likely that the detailed findings of an investigation will remain behind tight lips. The signs of rust make me suspect fatigue; stress-corrosion cracking in the bolts; which initiates at stress risers like threads; especially when they’ve been cut and not rolled. Most of the industry makes their towers with pretty much identical design elements. And design techniques rooted in 1940’s Engineering, plugged into 1970’s structural analysis software behind the blinkenlights of the 1990’s pretty pictures. Once the subsidies were rolling in easily for production, there was no need to be competitive or actually innovative. Mistakes could be repeated indefinitely because there is always somebody else’s money to pay for the “fix”. I would guess that the wind guys never did a cost benefit analysis. BTW I worked for a farm machinery subcontractor in my career and we did cost benefit analysis. If you put a very dense mass of copper, neodymium and iron on top of a thin 100ft/200ft/400ft pole and expose it to the wind, it will snap sooner or later – mostly sooner. I have experience of two very similar failures of cover bolts on a water turbine. One of them resulted in the deaths of 75 people (Sayano Shuskenaya). In both cases the bolts were not tightened properly initially and were not inspected for signs of metal fatigue even though an elementary inspection would have shown that some of the bolts had snapped off before the final failure. Metal fatigue can be prevented by good design and by making sure that the bolts are properly tightened. Partially tightened bolts are at more risk from metal fatigue than ones that have been fully tightened. There is a high chance that if all the bolts had been inspected before the failure occurred they would have discovered that some were broken or cracked. It is now – and it always was – essential that all bolts in a wind turbine that are at risk of metal fatigue should be checked regularly. M Simon says: “I worked for a farm machinery subcontractor”. I’d be interested to know more about your experience. Unfortunately, like everything we sceptics do, my research was done with no money in my own time and very much against the flow. I read a lot – I even learnt Danish – and eventually I tracked down one of the five engineers who started Riso to ask them about all this “research” they supposedly did. And then it dawned on me that all this “research” was what academics assumed must be going on rather than any knowledge of what Riso actually did (they tested windmills). And actually Riso’s main function was to act as a conduit of knowledge/experience between the various Danish companies – who were successful, because they were “hands-on” type companies “throwing metal” at problems and by that means they developed ugly windmills that just kept working. I think it boils down to the kind of people who end up controlling the company. Is it non-engineering executives without a clue how to build a plain, or is it a hands-on engineering director who if any of their machines went wrong they would not only know how to mend it, but who have to be stopped from rolling up their sleeves to get on with the job. What do you call 10 collapsed wind turbines? Flexible flanges decrease the fatigue life of bolts due to the prying of the joint under load. For the design of bolted connections under cyclic loading, see Chapter 17. N.B. : The whole tower is typically mounted on bolts standing proud of the surface. The gap between tower base and the top of the footing is then grouted with a non-structural material. It sure looks to me like an assembly failure, not weld fatigue or corrosion. Think about two vertical sections bolted together at a flange, a little wind loading from the left would cause tension on the left side of the flange and compression on the right side of the flange. The bolts in tension could fail from overloading leaving the flanges connected by underloaded bolts on the right side. Then the torsion from the upper section falling (to the right) would twist all heck out of the right side of that flange. Until the load topples further to the right and the bolts shear off. The photo of the upper flange (in the linked article) shows a flat flange (dented out of round when the section hit the ground). Seems the only way that could happen is if you pulled the top section upwards with enough force to break all the bolts, not likely. Also a few of the bolt holes in the pictured flange appear to have “gunk” (an engineering term) inside ? Seems to me they failed to install enough bolts, some failed on one side from too much tension and the rest on the other side sheared off before the flange could twist. They probably only put in a few bolts during the assembly steps and didn’t check to see that a full complement of bolts was installed. Hard to believe, but I’ve seen worse quality control. Also, when loaded bolts let go there is a lot of chunks of bolt/nut/washer flying around at very high velocity, where are the pieces/dents ? I think the mud/rust (hard to tell from a photo) is an “after incident” contamination effect. When something that heavy hits Terra-firma it is bound to kick up some mud/dust. Actually it is hard to believe that missing bolts would not be noticed from visual inspections over a ten year lifespan. But, bolts that where never torqued properly, that is more believable, a couple of properly torqued bolts amongst a sea of loose bolts could fail (eventually) just as this joint failed. A loose bolt with a long lever arm (the upper section) could easily have the threads stripped once the two flanges started moving apart with some momentum. I just find the “mostly” flat upper flange surface a tell tail sign that the joint (although properly designed) was not correctly assembled. For two sections to come apart exactly along a horizontal joint with no distortion to the surrounding structure is very unusual. A properly designed structure is usually strongest at the “field joints” to allow for improper assembly. In this case the improper assembly appears very poorly executed. Hi from Oz. Do we have enough data on wind turbine failures to adjust the claimed life down to an expected life, and thus be able to debunk the claims that the cost of renewables are anywhere near comparable to traditional generators? cheers, and a happy and safe Christmas to all. There are just way to many harmonics caused by the uneven blade loading same problem they had with the gear boxes! KevinK: For two sections to come apart exactly along a horizontal joint with no distortion to the surrounding structure is very unusual. I’m not sure we can tell from the available photos that there was not distortion. The photo showing the remaining 30m section still standing is taken from the other side of the structure from the line of fall of the upper section. A crease in that still upright section might be hidden from view. If studs started shearing as the upper section tilted, a lot of forced would have been transmitted around to the other side and this might be partly responsible for the ‘kidney’ shape of the deformed flange on the fallen section. Cascades of little failures can swiftly become total collapse. Inspection and prevention can only go so far upstream of such possibilities and avert so many ‘little failures’. Over-engineering is expensive, but likely the only effective precaution.